Before we start this article in details, let’s create a simple webpage and use POST method first of all. The use of POST method is simple and we will also use $_POST to get data from the forms. Figure 1: Output on browser of form with getting data from the user. In listing 1, the form is very easy to understand. But the main thing is to understand the action() and method() which is used inside the form tag. The action() function is used to send form data to the data.php, which is a .php extension file. And in method() we used POST. It means that it will help the method() to send data to the data.php. And the data will be fully secure and hidden from the other people. Now a days mostly web developers and web application programmers are using POST methods. Because it is secure and it is not a part of URL that is HTTP. In data.php file there is a simple programming. In which we used $_POST[‘ID’], its mean that it will get the data from the form where we used POST method. And it will assign it to a variable which we by self-declared it. And then we used the echo object to output the data on the browser, as you can see it in Figure 2. As you can see in Listing 2, it is easy to use the $_POST to get data. And don’t worry about word “ID” inside the $_POST it is the name of input take which we used in form tag. We commonly use these methods in PHP form validation. The easiest way is to assign the data of $_POST to any declared variable. Then use that variable in the whole PHP program, as you can see it in Listing 2 I used it. As you can see the result, when we used the POST method inside the form tag. So we get the result which is in Figure 2. And if we check the URL, so its look normal, there is no any security leakage. Let’s we use the GET method in the same webpage. If we check the Listing 3, so every line is looking same as we saw in Listing 1. But there is a change inside the form tag that is we used GET method instead of POST method. If we check the Listing 4, so you will also see a single change in it. That is we used $_GET[‘ID’] variable to get the data from the UserArea.html webpage. And it will do same thing as we saw in Listing 2. After using the GET method so what we see on the URL. We get our id and password over there which are fully correct. But it is not a good thing for a user if he/she wants to be login to their profiles on internet. The hackers will hack their profiles. And they will get their all private and secret data. Check the URL: http://localhost/data.php?ID=mrbool123&pass=mrbool123. The ID and Password is same which we insert to get login in our profile. If someone want to use the GET method so they are doing a big mistake. Because it is not secure and as we know there is a technique of hacking IDs that is PHISHING technique. It is a better idea if we use POST in these kind of webpages. When we use GET in webpages, so it’s mean that we are going to append that data in the designated URL. As you can see the Figure 3 for more details. And you should know that the POST is not the part of the URL. And the good advantage of using GET is to bookmark any URL. As many search engines are using it. As we know the GET is a part of URL so it will remain in the browser history. And the POST data will not remain in the browser history. There is also another advantage of using POST method that is we can use multipart/form-data for encoding of binary data. We can see many examples of GET in our daily life when we are surfing internet. For example http://search.yahoo.com/bin/search?seal=lishes there are many examples like this in which we can get data easily. There is another method in PHP programming which we can use it instead of POST and GET that is REQUEST. Commonly we call the $_REQUEST is an global variable which is can be execute form any part of the PHP program. There will no need to declare a global variable when we are using $_REQUEST. If we are using POST method to send data or GET method to send data from the form to PHP programmed webpage. So we can receive them or get them by using of $_REQUEST. 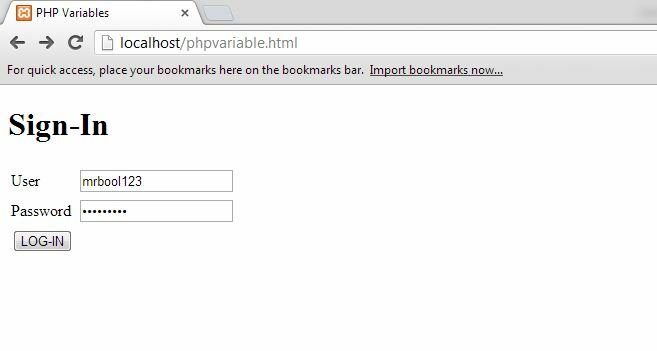 So let’s we try this variable to receive data in PHP webpage. If we check the coding of Listing 5, so there we used the method as POST and its mean that it is not a part of URL and HTTP. Our data will be secure from the hackers, and it will be receive securely on PHP webpage as you can see the coding of PHP webpage in Listing 6. The output of this will remain same as we saw in Figure 2. Let’s we change the method from POST to GET and check what happen? If we see the coding of Listing 7, the html based webpage. So we just replace POST with GET. And will not do any changing in the PHP webpage. We will use the same PHP webpage as you can see the coding in Listing 6. And the output will same as we saw in Figure 3. Follow the Listings numbers from 5 to 7. Then you will able to understand the features of $_REQUEST in PHP webpage programming or development. After discussing the $_REQUEST the global variable. We now able to know that we can use it instead of $_POST and $_GET. And the output or we can say that the processing functions will remain same or constant. And the predefined $_REQUEST variable also contains the data of $_COOKIE. Which is not discussed in this article because it is fully change from our topic. From this article we learnt that what the difference of POST and GET methods is when we use them in form to send data to another webpage. And also we discuss the $_REQUEST to use it instead of $_POST and $_GET. I hope your all arising questions will be solved by reading of this article. If you have any kind of query related to this article please do a comment without any hesitating.